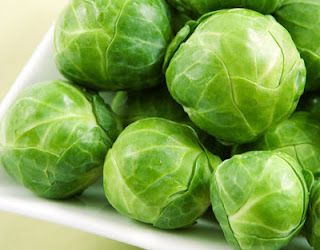 The humble brussels sprout. I honestly can't remember the last time I had brussels sprouts before last night, they weren't exactly a staple in our house when I was growing up and I often skipped over them in the produce section. It was nothing personal, I just think they got a bad rap for so many years as people overcooked and boiled them to death until they had all the flavor of a tough gym sock. I'm also not a huge fan of cabbage. Don't get me wrong, I like it raw in coleslaw and shredded in salads, but whenever it is cooked I tend to avoid it. Still, as I was planning out our dinner menus for this week, I came across a simple recipe for a stovetop preparation of the tiny cabbages that I thought might be a good substitution for our usual staple of roasted broccoli. The sprouts were delicious and the recipe was so easy I'll definitely be trying it again! I served them up alongside pan-seared salmon and mediterranean couscous for a seriously quick and easy weeknight dinner. Keep in mind that I cut the recipe in half and it generously served two adults, so adjust your measurements accordingly if you decide to give it a try! I also just left off the cheese and they were delicious all on their own.